A last-minute decision by MTV in Mexico not to broadcast an episode of the US cartoon show South Park has caused controversy. The episode portrays Mexico’s president as a leader who wastes funds and irritates the international community. MTV Mexico said they did not get a special permit needed to broadcast an image of Mexico’s flag, seen briefly in the same scene as the president. 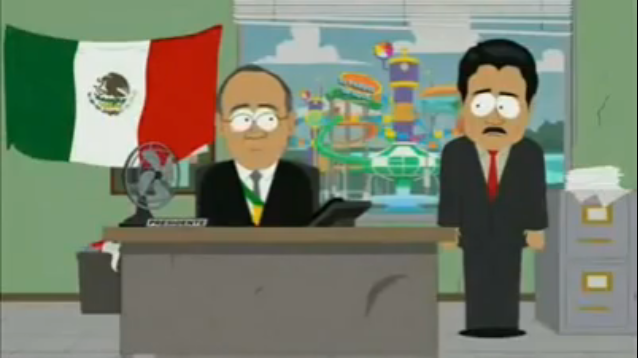 But Mexican South Park fans reacted with scepticism to that explanation. “Has it been censored by the Mexican government?” wonders a blogger at the popular MexaBlog, while comments on other websites ridiculed MTV’s decision. A spokesman for MTV Mexico reassured the BBC that the reason the episode was not shown was that the permit required to show the flag did not arrive in time for the scheduled broadcast. A part of the episode can be seen on here on Youtube. This entry was posted in Government, US-Mex relations and tagged Calderón. Bookmark the permalink.